Seclusion and fun in the mountains – welcome to Mountain Treasure, a 2-bedroom luxury cabin that sleeps 8 people in comfort, a spacious 2-story cabin in a private park-like setting. 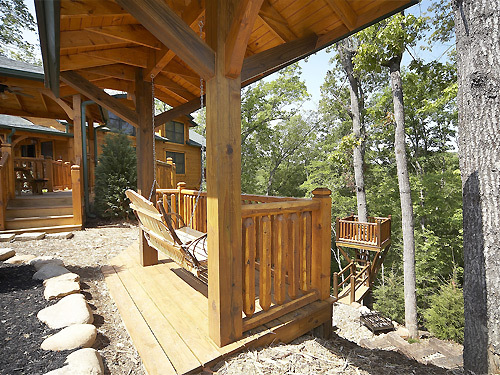 Mountain Treasure is a cabin packed with amenities inside, and with its own picnic pavilion, tree-house and park swing outside. Mountain Treasure has a bedroom on each floor, each with a king bed and adjoining full bathroom, each with vertical jetted spa. Two queen sleepers are ready for extra guests, in a spacious design that allows plenty of game and entertainment room inside. 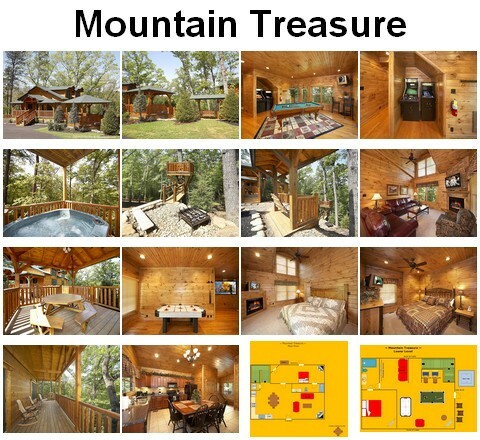 Mountain Treasure is perfect for an active family or any group of friends, with plenty to do, even for kids. The game area holds a pool table, an air hockey table, and 2 game arcades, as well as a home theater! TVs and DVD players are located throughout the cabin. Outside the cabin, the surroundings add to the play space. 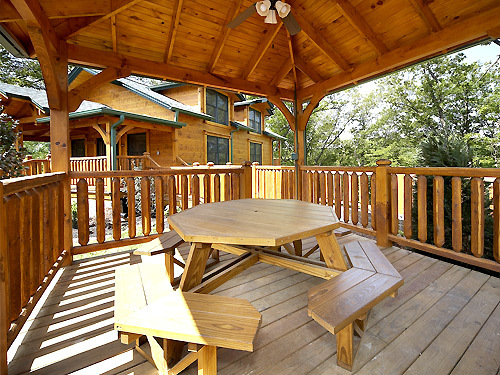 With 3 decks, the cabin has a hot tub, rocking chairs and a porch swing. In the back yard, the cabin has its own covered picnic pavilion, a fire pit and charcoal grill, a covered swing and even a real tree-house! 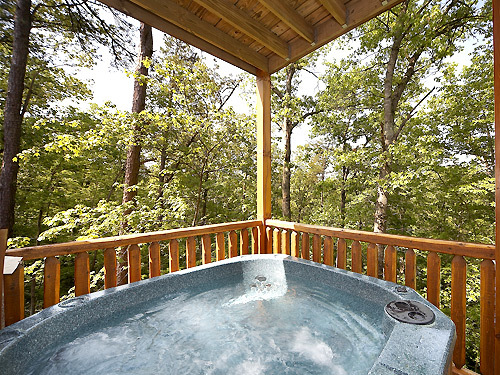 Mountain Treasure is located in the select “Gatlinburg Falls at the Park” enclave, a preservation-intensive 16 acres of natural forest bordered by National Park Service land, and holding only 9 cabins. Natural trails are an extension of the outdoor living space, for easy walks that just happen. The best part of a cabin in the Smoky Mountains is the daily living, moment by moment. It goes beyond mere accommodation on your trip to the area, and becomes a place you wander through, enjoying the amenities, cooking, dining, being entertained, socializing, soaking in the tub, gazing at the view and simply relaxing. It’s easy to think of the place as home. 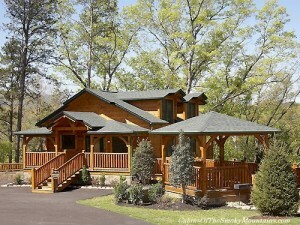 Mountain Treasure is a cabin you will want to call home. It’s positioned midway between Gatlinburg and Pigeon Forge, and even closer to Dollywood. There’s ample parking. Sorry, pets cannot be brought to Mountain Treasure. Click here to check availability and book Mountain Treasure for your next trip! Cabins of the Smoky Mountains manages over 500 cabins. 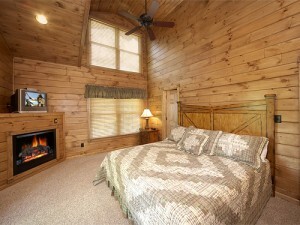 If Mountain Treasure is not available for your planned stay, we can find you an equivalent cabin that is. Call us anytime at 855 91 SMOKY, the phones are open 24/7! Mountain Treasure cabin. CLICK HERE to book and for images, amenities and availability.